This three-hour workshop requires a $30 ticket that can be purchased at www.TheEnergyFair.org/tickets or on-site (space limited). Join fermentation aficionado Linda Conroy and learn the principles of fermentation. Once we have this understanding, we will dive in and make as well as sample a wide variety of ferments, adding herbs and wild food for flavor and nourishment. We will make carrot/burdock kraut, a brined vegetable, a fermented beverage using a ”ginger bug”, cultured butter and more! These ferments can easily be replicated at home. Everyone will enjoy samples and recipes to take home. 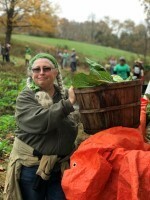 Linda Conroy is a bioregional herbalist who has been a community organizer, and practiced for over 20 years. She dedicates her life to connecting with the green world and invites others to do so through workshops and apprenticeship programs. Her primary mentors are the plants who never cease to instill a sense of awe in her daily life. Participants in programs offered by Linda walk away with an appreciation for the natural world as well as skills for incorporating plants into their daily life!